Why Did China Drop Its One-Child Policy? 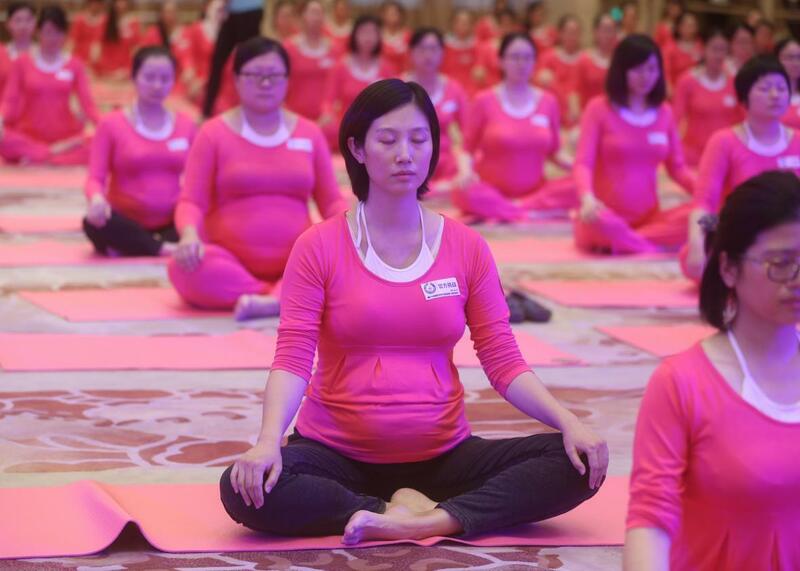 Pregnant women practice yoga on Oct. 25, 2015, in Beijing. The one-child policy is a policy that the Chinese government has relied on for far too long; it should have ended 15 years ago. If that had been the case, the first batch of second-children families would be thinking about entering university and technical colleges soon, shortly after 2015. By lifting the one-child policy in 2015, this means that these “extra” children will not begin to enter the workforce until 2035, so Chinese society will be going through a period of at least 20 years where the workforce is aging. This also means that tax revenue from income tax will also shrink during this period. And this happens at a time just when China needs to shift from reliance on investment to reliance on tax revenue. This happened because no one in the Chinese government was willing to stand up and make this call and implement this decision. Social planning with regard to human reproduction is not something that can be turned on and off like a switch by Beijing party bureaucrats. In fact, the party had been softly lifting the one-child restriction in major cities for the past two years. However, most one-child families have continued with only one child. They’ve chosen not to have a second child because raising a child is very expensive, especially when you consider education costs in China. Chinese society has been highly competitive for a long time—the competitive civil service exams have been around for 1,600 or so years. This means that the Chinese educational system is all about exam success and getting into the right schools, and getting into the right schools are very expensive. This means that having a second child is a huge extra expense for Chinese families. In addition, the Chinese economy is going through a period of readjustment, and no one knows how it will manage the transition. If prospective parents are not sure that they will have jobs and the right skills, they will choose not to have second children because they do not want to carry the extra risk. Another factor is that parents will think about what the world and Chinese economy will be like in 20 years, when their children enter the workforce. It is hard for them to have confidence in an economy that is changing so much so fast. The Chinese economy is likely to have a gradually shrinking and rapidly aging workforce. Those Chinese who can afford it would prefer to emigrate from China rather than stay, so China will only have the Chinese who can’t leave China. Those who have the ways and the means will be living outside China, as Americans, Canadians, Australians, New Zealanders, and Brits, along with every other nationality in the world. Economy of China: Why does China have so many ghost towns? China: Is China rich or poor? Why? Politics of China: Why shouldn’t Chinese people fight for democracy?